If you were featured here grab this button! All projects and photos are linked back to the original idea if they are not my own. 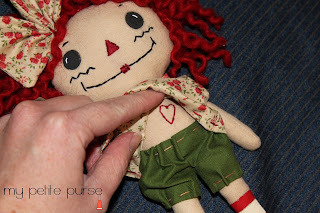 Any photos that are mine are marked with the mypetitepurse logo. You are welcome to use my photos and ideas as long as you link back to me. Please leave a comment and let me know you stopped by. 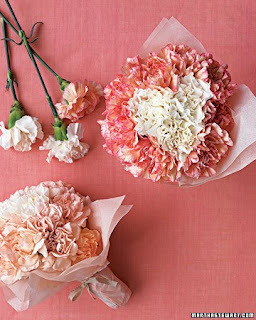 I am in love with fabric flowers these days. There are so many cute ones that I have seen around the blogging world. And they are good for so many things: pin them on sweaters, headbands, purses, cards, or pillows. Or ALL of the above. I found the one pictured above here (via here) along with a really great tutorial. The great news is that it takes very little fabric and an even smaller amount of sewing skills (only a needle and thread and a simple stitch or two). Here are some other links you should check out to fall in love like I did. Here is one with lovely polka dots and a tutorial. Here is a cute idea for using fabric flowers on cards that I love. And here is a totally unique version I haven't seen anywhere else with a template included. If you make one, please send me a picture. I'd love to see how it turned out. I made this a few years ago. It was my mother-in-law's idea for a craft group she was doing. She found these little white shadow box frames on sale at a craft store for 99 cents. First, we chose a Valentine themed paper as our background. We removed the back panel of the frame, traced it on the back side of the paper, cut it out, and glued the paper to the front of the back panel. Then I took the "X" and "O" which she also got from the craft store as is and glued pre-painted hearts (from the craft store) on them. I also wrapped some wire around each letter. Then the letters were glued to the paper with heavy duty glue (E6000). I also added a piece of wire and a heart to the outside bottom corner of the frame with some hot glue. Variations: some of the other crafters painted their frame red, covered their letters with paper, and/or painted their letters. 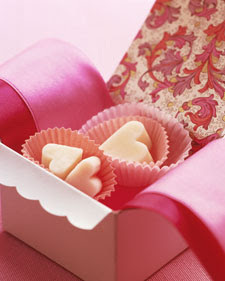 A simple gift to put together that is great for the person that appreciates a "low calorie" Valentine. I got a nursing bracelet from my sister. It's a bracelet that you wear when you are nursing so that you can keep track of the last time you fed your baby. You just clip the charm in between the numbers that correspond with the time. If you last fed your baby at 1:30 then you would clip the charm next to the middle bead in between the 1 and 2 (as pictured in the second picture above). She made it with memory wire, beads, and a clasp with a charm attached. I kind of like the bracelet in itself, nursing or not. 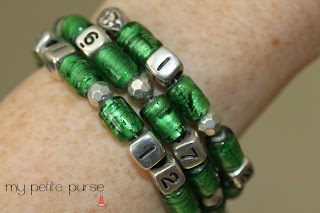 I think the numbered beads are a fun look. If you like Disneyland and you might be planning a trip in 2010 take a look at this cool service promotion Disneyland is sponsoring. Ages 6 and older can spend a day of local service and earn a free day pass to a Disney theme park. You must preregister so click on the link below. Type in your zip code and find out what you can do. What a great gift idea! This gift idea is great for the new year, but any time is a good time to start. These are called 52 week books. Each book has a theme (such as Gratitude, Service, or Friendship) and has a page for each week of the year (52 weeks). Every week each family member shares an experience that happened that week that is related to the theme. Then the family picks one to record in the book (or you can record all if you want). It is a great tradition to begin and creates an easy and fun way to look back on your memories and teach children valuable lessons. There's even more good news. These books are really easy to make. All you need is a notebook from the dollar store and some scrapbooking paper. Each purchased notebook makes two 52 week books by taking off the binding and cutting the pages in half horizontally. Then decorate the cover however you want. Then, cut the binding in half and re-bind each book. If you want, you can also put a number on each page (1-52). Each year your family can pick a different theme to focus on. This would also be a great journaling idea for an individual, a child, teacher, or a couple too! Thanks for sharing this great idea Gwen! My sister made this cute magnet board to keep track of birthdays and anniversaries. She used vinyl to separate the magnet sheet into months and then printed out a piece of paper for each member of the family with their name and date of birth on it. She also included anniversaries. Then she backed the paper with magnet strip tape. There are a ton of possibilities for how you do the magnets. Check out this, this, and this for more great ideas on magnets. I love this idea because it is a great way to make room for more birthdays and anniversaries as new additions join the family. My friend, Liz, helped me make these cute little baby boy ties for my sister's little one on the way. I don't really sew unless you count Home Ec. so this was quite an accomplishment for me. If I can do it so can you! This was a pattern for 6 month to 1 year size ties and they use less than a 1/4 of a yard of fabric. Very affordable, creative, and fun to make and give! Update 01/23/10: I found the tie pattern online. It can be purchased here. I know that Christmas is over for now, but I couldn't resist sharing this great idea for a neighbor gift found here. You can always use it next year, right? It is a simple and inexpensive way to give to everybody that you WANT to, but sometimes can't because of all the other things that take up your time during the holidays. 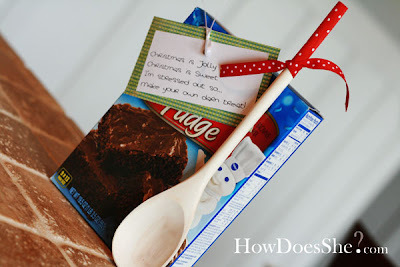 Plus, I personally haven't tasted a homemade brownie that was better than a good old boxed brownie mix. You can't beat that fudgey goodness. 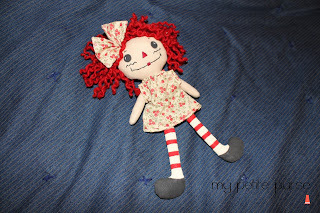 My sister found a great site called ohsewdollin where she got a free pattern for this darling raggedy doll that she made for my daughter. 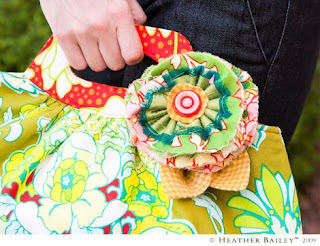 There are tons of cute patterns to choose from that can be purchased as well. My sister estimates that the materials for this doll cost her about $5 (although she had to spend more than that on the materials, but she can make multiple dolls with the leftovers). Don't you just love it? Keep your eye out for those limited time only free patterns on the website. Or purchase a pattern and put it to good use. Here is a great gift idea even for the littlest of girls. My 18 month-old got this little make-up set from her aunt. But don't worry. That isn't real make-up - it's dried nail polish poured into old, empty make-up cases. And the little nail polish bottle is a fake too. The inside of the bottle is coated in nail polish so that it looks full, but really it is empty. My daughter loves feeling so big with her little purse full of make-up and it's great for moms too because there isn't any messes to clean up! Save those make-up cases or ask your friends to save theirs. They would be great to have on hand for a great gift. 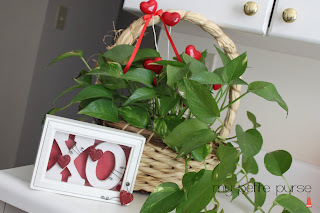 Using two colors of carnations you can make a heart shaped bouquet found here. Click on the link for simple instructions. A simple idea to dress up your baked goods found here. Just cut hearts out of tissue paper. On an ironing board lay down a layer of paper towels, then wax paper, tissue paper hearts, another layer of wax paper, and another layer of paper towels. 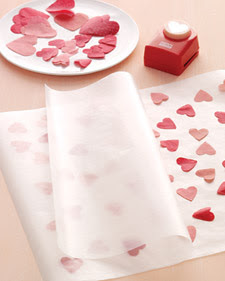 Set an iron to medium heat and lightly iron over the layers to set the hearts onto the wax paper. 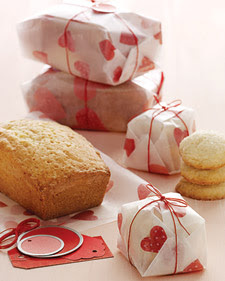 Consider all of the different shapes you could use to dress up your wax paper for baked goods. This could be great for any holiday or occasion. Add this to the countless things you can do with a brown paper lunch sack. 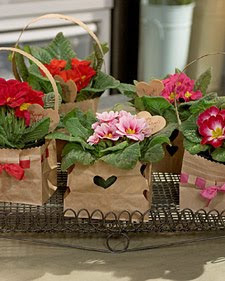 I found this cute Valentine gift bag for a potted plant here. I love getting potted flowers because they last a lot longer than cut flowers and this is a great way to dress up a planter. I especially like the bag with the ribbon weaved around it on the right. Maybe this looks so good to me because I didn't get enough homemade fudge over the holidays. 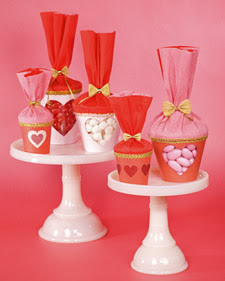 I found this idea here for some heart-shaped fudgey Valentine treat. I need to get me a candy thermometer and try this out! Let me know how it goes if you decide to do this. I know it's really early to be thinking about Valentine's Day but sometimes I find really cute ideas a little too late and I always wish I would have started earlier. So here I go. This is one of my favorite packaging ideas because it is simple - found here. These are made with clear plastic cups with a piece of cardstock wrapped around it. And I love the heart cut-out window, don't you? Then you glue a piece of double-sided crepe paper around the top of the cup and fill it with treats or gifts and tie a ribbon around it. Click here to get a free template for the paper that fits around the clear cup. Gwen and her daughter Nikki made this fruit bouquet for Nikki's teacher. They found a flower pot at Michael's and cut a head of iceberg lettuce to fit inside the pot. The greenery they used as filler here is kale. Then they used skewers to stick the fruit into the iceberg lettuce: grapes, strawberries, cantaloupe, and pineapple. So cute. And something that kids can be involved with. Have great gift ideas for the weak of wallet? Or have questions about the projects? or leave a comment to say you stopped by!